Paté with Turkey, Beef & Ocean Fish Multipack is a multipack by Applaws with three different flavours of paté for your cat. This Multipack contains a combination of the flavours turkey, beef and ocean fish. Each tray is low in carbohydrates. This supports digestion. One pack contains 7 100-gram trays. The Applaws paté is made with 100% natural ingredients. These are brought together in this creamy and low-carb meal your cat. This convenient multipack contains three different flavours: Turkey, Beef and Ocean Fish. Each tray is packed with fresh meat or fresh fish and is supplemented with trout and turkey. This wet food is low in carbohydrates, which contributes to the digestion of your cat. Paté with Turkey: Chicken (35%), pork (27%), turkey (4%), trout (4%), fish (4%). Paté with Beef: Chicken (35%), pork (23%), beef (4%), turkey (4%), salmon (4%), trout (4%). Paté with Ocean Fish: Chicken (35%), pork (23%), turkey (4%), salmon (4%), trout (4%), ocean fish (4%). 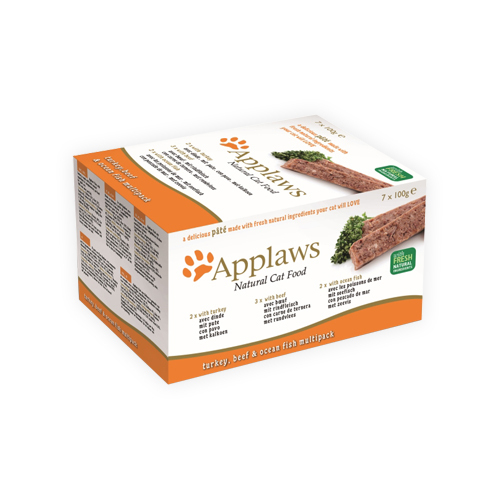 Have you used Applaws Cat Food -Paté with Turkey, Beef & Ocean Fish Multipack before? Let us know what you think about this product.